Country chicken farming is perhaps one of the easiest poultry management methods since it involves minimum labor. It is something that the family members can join hands in doing. Learn how to start country chicken farm project(‘desi murgi palan’ or ‘nati koli farm’). 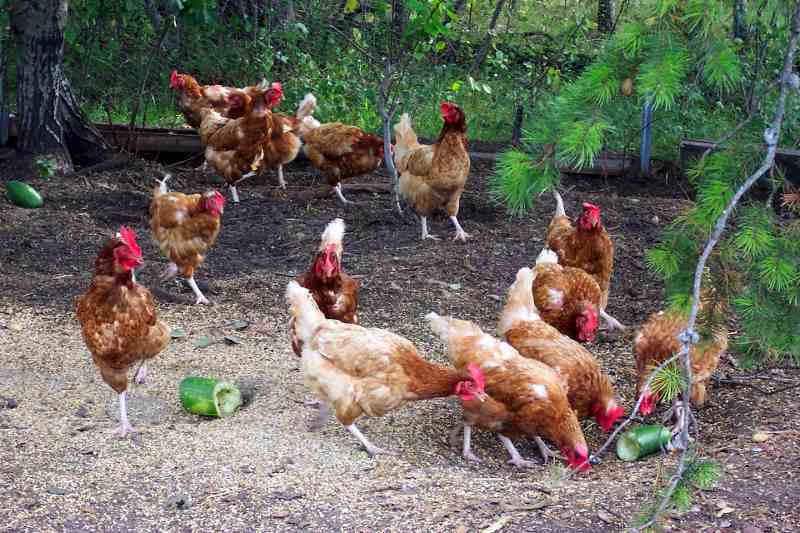 Poultry farming of country chicken or rural poultry farming is been in practice since decades in India. Generally, in backyard poultry, local, indigenous birds are reared. Traditionally these birds had a poor egg and meat production capacity compared to commercial broiler and layer farming. But with improved strains there is a considerable improvement in the performance. The biggest scope of country chicken is the low initial investment and high economic returns. The per capita protein consumption has been a subject of concern since quite some time in India. Eggs and poultry meat are the cheapest and most easily available option for this. Although there has been a tremendous growth in poultry farming over the past few decades, rural poultry has not shown much improvement. This is because it has been largely neglected sector. The key lies in focusing on the various aspects of rearing, better management practices and a scientific approach. Low initial investments clubbed with higher economic returns. Country chicken farm can be started with just two birds and gradually increased to a flock. Owing to the high demand of local chicken, the birds and the egg produced by them can be sold in the local market irrespective of the season. Leftover feed, grains and various agricultural by-products can be used as feed for the birds. In other words, the feed cost is negligible. Country chicken or ‘desi murgi’ and brown egg variety has a higher demand than other breeds. There is no labor cost practically involved since the family members especially children and senior citizens act as ‘laborers’ in maintaining the farm. Hence it is a boost to the family income. Since the eggs and poultry birds can be sold almost any time, rural poultry is a form of ‘any time money’. If the birds are raised in an organic farm then the quality of the chicken and eggs are much better. This is because the birds are raised in a stress-free environment. In this method the poultry wastes like droppings, extra feeds etc. are directly applied as organic manure and increases crop yield. Jharsim: A variety specific to Jharkhand. Kamrupa: Suitable for free range farming in Assam. Pratapdhan: It is a dual colored bird meant for Rajasthan. Other ‘desi murgi’ breeds that have been developed are CARI Nirbheek, CARI Shyama, Hitcari and Upcari. These breeds were developed at the Cantral Avian Research Institute (CARI), Izzatnagar. Varieties like Gramapriya, Vanaraja, Krishna-J, Girirani, Giriraja, etc. can be reared almost anywhere in India. Gramapriya and Vanaraja produce 200-230 eggs annually with the individual egg weight varying between 55 to 60 grams. They start laying eggs at the age of 200 days. The age of first lay varies with the feed, nutrition and other management criterion. Since country chicken is of the sturdier and adaptable type, they do not need elaborate housing preparations unlike other breeds. The houses must protect the birds from harsh sunshine, rain, wind and cold stress. It should also protect them from frost during winters. In case of free range rearing system the birds are let loose to forage during day and kept in pens during night time. In order to avoid direct sunlight and encourage maximum air circulation the houses must be built in the north-south direction and not in the east-west direction. Inexpensive, locally available housing materials like bamboo, wood, thatch, grass, etc. are used for building the houses. The floor is at an elevation to avoid water accumulation or flood-like conditions. It must be free of rat trouble or water cracks, must be portable to enable shifting the position of the houses if need be and they must facilitate easy cleaning. There must also be a bulb fitted at the ceiling to keep the chicks warm and provide light. During the growth stage the birds are fed with the standard starter feed for chicks available in the market. In addition to the feed collected through scavenging, the birds are also fed with azolla, drumstick leaves, waste grains, mulberry leaves, etc. during the growth stage. After 120 days the average body weight must be 1.3 to 2.4 Kg. In addition, they must be fed in small quantities from time to time during the initial few weeks this helps in stimulating the feeding habit. In addition it helps growth of skeletal feathers and develop a good immune system. Natural Brooding: In natural brooding, indigenous broody hens are used as sitters. The hen is provided with all the necessary nesting materials including food and water. Eggs belonging to improved variety are used for incubation. Once the eggs hatch, the chicks are left with the mother for scavenging. Special provisions are made for the chick and the mother for the nights. A Broody hen can take care of 12-15 chicks at a time. Artificial Brooding: No broody hen is used in this case. Instead there is a provision for supplying artificial heat. There are specially designed ‘bukharies’ in which wood, charcoal, kerosene, saw-dust, etc. is used as a heat source. The temperature is maintained at 95⁰ F in first week. In the following weeks, it is reduced by 5⁰F till the 6th week. On an average a heat of up to 2 watts per chick is needed in the brooding stage. Once the chicks are brought to the farm it is the farmers’ responsibility to ensure its wellness and good health. There are a few points that must be considered precisely for this purpose. The chicks must be placed in the brooder and the feeder must be replenished more at least twice a day and more if need be. They must be stimulated to drink water. For this purpose cups are placed in the initial period. In case of artificial brooders their temperature must be checked regularly. Too high a temperature would result the chicks in moving away from the bukharies while too low a temperature means the chicks would huddle together. Chicks brooding in deep litter need about 280 cm² of floor space per chick. From the 6th week approximately one square foot of floor space must be provided. Overcrowding in the brooding stage can cause stress thereby leading to infections and mortality. The feed conversion ratio and growth must be proportional to the floor space available for the chicks. The idea behind providing light in brooders is to increase the feed consumption and thus maximize the growth in a very short period of time. For the first six weeks there must be continuous light for the up to 48 hours. During the growth stage 10-12 light hours is needed. While providing light provisions, there must also be a chick guard to prevent the chicks from coming directly in contact with the heat bulb. It is normally made of cardboard. For a day old chicks, they must be provided clean drinking water in troughs. The amount of water must not be more than 2 cm high. For the first three days, irrespective of the type of brooding bell-shaped water drinkers are recommended. The drinkers must be placed near the hovers. Accumulation of carbon dioxide and ammonia clubbed with oxygen depletion is one of the major causes of mortality at the brooding stage. If the brooders are fit with airtight curtains it would lead to a lot of gas accumulation and suffocation of the chicks. Hence a head space of 3.5 inch must be left between the ceiling and the curtain to ensure air circulation. Similarly a relative humidity of 65% must be maintained. Care must be taken to prevent the relative humidity from dropping below 50% as it would result in dehydration among the chicks. Spraying disinfected water is one way of maintaining humidity at the optimum level. Trimming of beaks may seem absurd but it is an important step to prevent feed wastage and cannibalism. It is done in the 3rd week and about one third of the beak is trimmed. Cauterization of the beak using hot iron is the most commonly used methods of beak trimming. It destroys the beak growth tissues and also arrests beak growth. During cauterization care should be taken to not burn the tongue. This is a very important step in controlling the diseases among flock. The litter must be kept dry and stirred regularly. Stirring helps in regulating the temperature, humidity levels and ventilation. Marketing country chicken is very simple since local, indigenous chicken variety is always in demand in the markets. They can be supplied in shops or the farms can have a tie-up with hotels for supplying country chicken on a regular basis. Country chicken farming(‘desi murgi palan’ or ‘nati koli farm’) is an alternative source of income in integrated farming system. Please talk with our experts to get consultancy. Can we book in this website? Right now we do not provide online booking of products. Other wise gave me your mobile number I will call you. Hello! 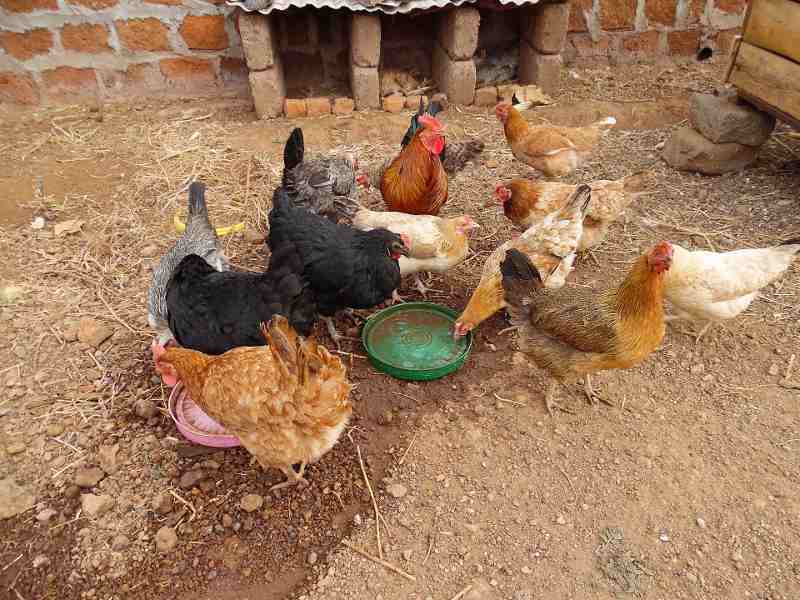 Country chicken farming is very profitable with much less investment. Please talk with expert to buy professional consultancy service. Thank you, we’ve got your your inquiry. We have started Pilot project of 250 chicken which has RIR, Giriraja and Kadaknath. Our plan is to extend the next batch to 1000 chicken after watching results of current batch. 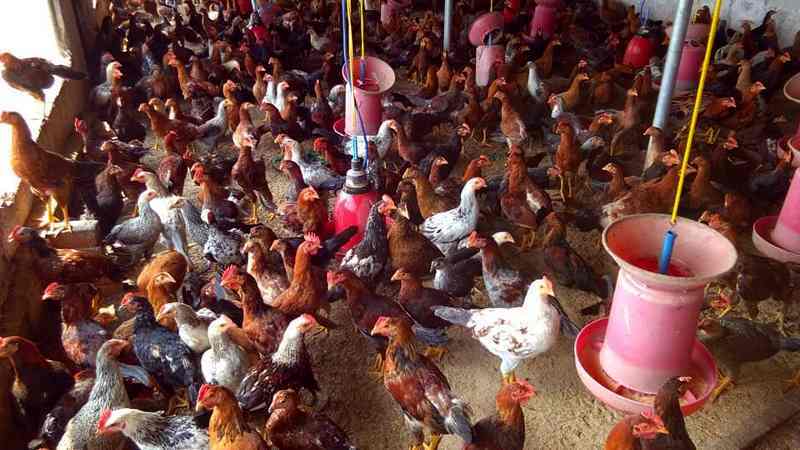 I have 650 birds (500 hens+150 males) (6 months age) of DP-Cross breed. All birds are healthy and infection free. All necessary vaccines are given time to time. I am aiming for egg production but till now the results are not so good. I am getting hardly 30-35 eggs per day. Feeding is ‘Layer mesh’ 120-140gm/bird/day. Egg quality good. weight of an egg is around 35-40gms. How can improve number of egg production? There are many factors involving in the laying capacity. Please contact our experts to buy poultry consultancy service. Very helpful. Thank you. Can you please explain what’s the best local breed available in India for egg production and what’s best for meat? Are you going for commercial poultry farming? If yes then you should consult with experts before investing. If you’re going for noncommercial hobby farming then refer these articles- Poultry farming in India, Broiler farming guide and Poultry layer farming guide. I’m planing to start business desi bird & desi eggs plz let me know how to start the project n contact u thank u so much. Thank you for your interest in Desi chicken farming. You may contact our experts for consultancy in your country chicken farming project. Contact our expert if you need professional consultancy service on poultry farming. I want to start a Desi poultry farm. Plz guide me. Are you willing to buy professional consultancy service for poultry farming? We have started poultry project with 200 chicks, how to maintain poultry batches? My land is approximate 60 acre and this is ideal for mix farming(cattle,poultry and fish), where I can buy RIR chicks first can you help me sir? You have ideal land size for commercial mix farming. Never invest without proper guidance. Please book our primary consultancy service to talk with our experts.